SORRY for my absence. I'll probably won't post much for another couple of days starting now because tomorrow me and the boy are off to Barcelona for the week. Will most likely be on Twitter though! 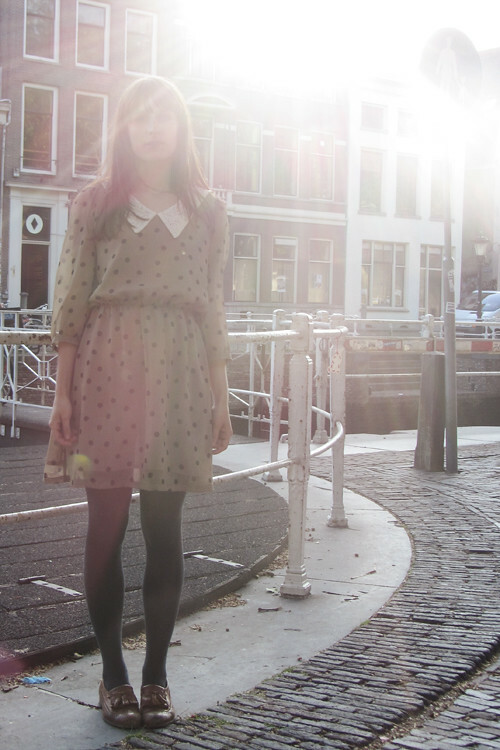 Here is a lovely dress I got from Miss Patina. Absolutely adore their new summercollection! Yesterday we went to Paradiso to see Sam Amidon. The man is a delight. Awesome music, awesome show, awesome banjo skills. A couple of days before that we saw this awesome band called Vessels. Genius! By the way, I uploaded a different version of the video I had in my previous post. Got a lot of complaints that it was blocked in the U.S.! CLICK. This time there is no song so you can use your own music or sing or just watch it in silence. Back to packing my suitcase! Gorgeous dress! The collar is adorable! Veel plezier in Barcelona! Supermooie jurk. I would like to order some dresses from Miss Patina, because I love this retro and pretty style... but I saw there was only "S-M" and "L" sizes... I don't know if it will be OK for me, because usually I'm wearing XS size. Do you think it could fit? I'm also an XS, I'm really really tiny, but the dresses usually fit. They're sometimes a bit on the baggy side but the dresses are made in a way that it still looks really cute. They're never supposed to be super tight-fitting. I guess it'll depend on the cut of the dress whether it'll look cute or not but up to now I always find they fit well! wonderful dress! and the pics look great against the sunlight! Prachtig jurkje & mooie foto's! Looking lovely :) Have a brilliant time! The dress is so wonderful. Such a cute dress! There are so many Miss Patina dresses on my wishlist right now that it's not even funny! So cute and lovely, this dress is absolutly chic.